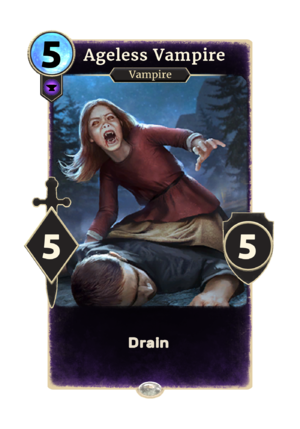 Ageless Vampire is a rare Endurance creature card. It cannot be obtained as part of your collection, but instead Little Girl changes into it. *Does not play when the card changes, only when summoned through other means (such as a reanimation lane). The card is based on Babette, who first appeared in Skyrim.